Recently I discovered a website called eSalon. This is a website where you can order your home hair colour kit and get it sent directly to you. 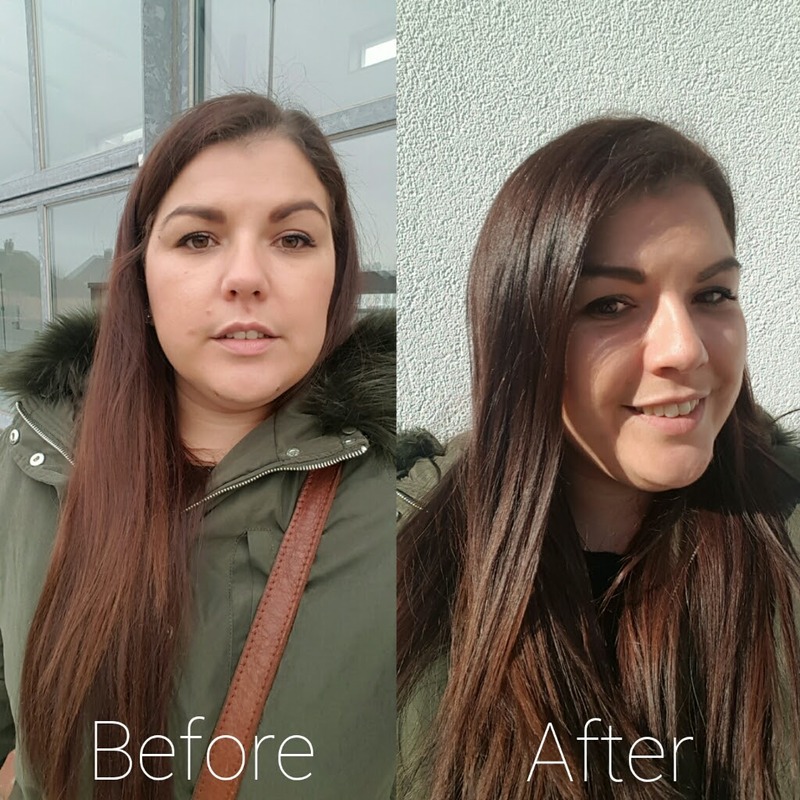 I had a referral link to get my first eSalon Hair Colour kit for only £7, which I thought was a complete bargain and you also got an extra bottle of colour FREE! The image above shows what came in the kit. This site is a bit different to your usually just log in and place an order. You set up your own profile and they ask a few questions about your hair, like how long is it? How much grey do you have? How thick is your hair? and what is your natural colour and currently dyed. Then you get to pick what colour you would like to dye your hair. You only get certain options depending on your current colour as for drastic colour changes that would take a few steps to achieve. You can also choose to add photos to your profile which will help your colourist create the perfect colour for you. 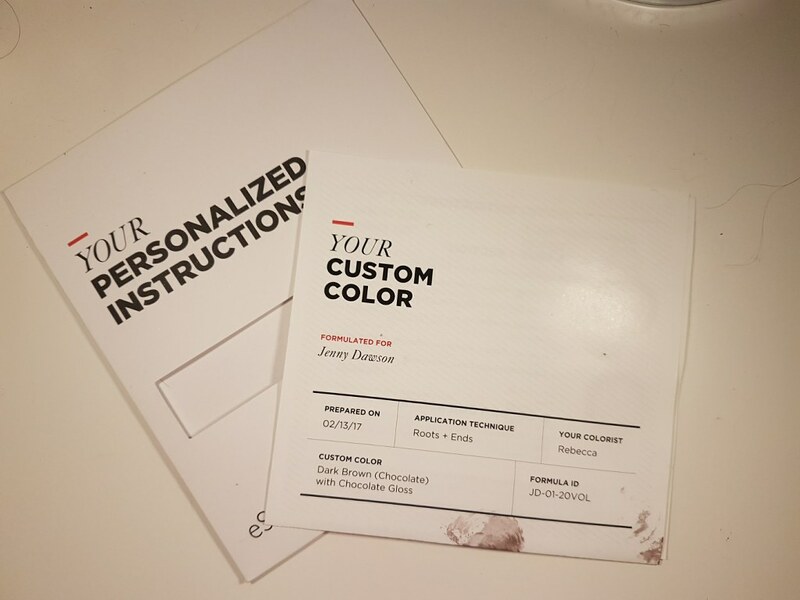 It is kind of a subscription service as you can choose to get your colour sent to you, say every 4 to 12 weeks, but you can change this at any time and cancel at any time as well. So if you didn’t want anymore after your first box then you can just cancel it without any issues. Once I had chosen the colour I wanted which was a Chocolate brown 4:15 and placed my order, I was designated a colourist who got in touch to discuss the colour I had chosen. She had suggested, that based on the details I had given, that I was going two shades darker and would I rather do this gradually. I then added a couple more photos I took that day and uploaded them so my colourist could have a look, and I said I may have got the colour wrong for what my current colour was. My colourist then had a check and everything was good to go. The colour you receive is created just for you and you also receive a bottle for the lengths of your hair which is a Gloss colour. You don’t get the second bottle every time, but you can add this to your order when desired. The main bottle is for your roots. You get two pairs of gloves in the kit, a shampoo and conditioner and a stain guard and stain remover. These do come in handy when dying your hair at home, as let’s face it, it is very hard not to get the dye all around your face! The shampoo doesn’t contain any sulfates, which can cause the colour to fade. With your first kit, you also get a brush to help you apply the dye, I already own these but you can never have too many and it is great if you don’t have one that they include it. You know the colour is formulated especially for you as the bottles even come with your name on, which I think is such a nice touch. Even the instructions are personalised as well! I have very long hair and one thing I always worry about is having enough dye in a home kit to cover it all. What I love about eSalon is that each bottle equates to one and a half bottles of your typical box dye kits. This is perfect news for me and there was more than enough for me, I even had a bit of a mishap where I spilt some of it down the sink!! Yep, I knocked over my bowl and watched some of my precious colour escape down the plug hole! Disaster! But thankfully I still had enough dye to cover all of my hair. Phew! The instructions are very simple to use, sorry about the dye in the photo, I forgot to take photos of these before using it! There is a step-by-step guide of what to do and if you have never previously dyed your own hair at home, you will find it very simple to do. eSalon share lots of tips and videos as well which you can find on their Facebook page to really help you know how you should be applying the dye to get the best results. So I applied the dye and waited the time stated (probably more as I never time these things very well!). I then jumped in the shower and used my second pair of gloves as it says to use any leftover dye in the shower. You apply the left over and add water and lather it all up for about 1/2 minutes. I then rinsed it off, it was at this point I thought it felt a little strange like I couldn’t get the dye off. I started to worry a little and thought ‘uh oh I’ve left it on too long!’ I then grabbed the shampoo sachet and applied it to my hair, it went really soapy and my hair felt normal again. After about a minute the bubbles disappeared which was another strange thing, so I just rinsed it off.. and voila my hair felt dye free! I applied the conditioner and left it for a few minutes before rinsing off. I have to say I am very happy with the results. I have used many box dyes but none of them can compare to this. The colour is so even and shiny and it makes my hair look amazing. I didn’t go for a drastic change, I just wanted to refresh my colour. As you can see from the photo the colour is very similar, it is just nice and shiny and even all over now. 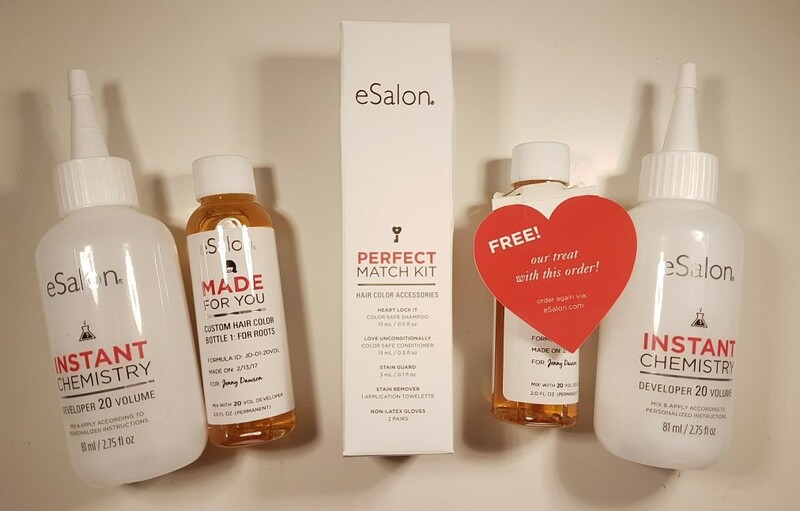 I would highly recommend using eSalon, even if it is just to get your first kit for £7 which includes two bottles of colour! I just couldn’t resist such a bargain! If you want to get one of these kits yourself then you can do so HERE. It is a link that will get you this kit for half price – £7. 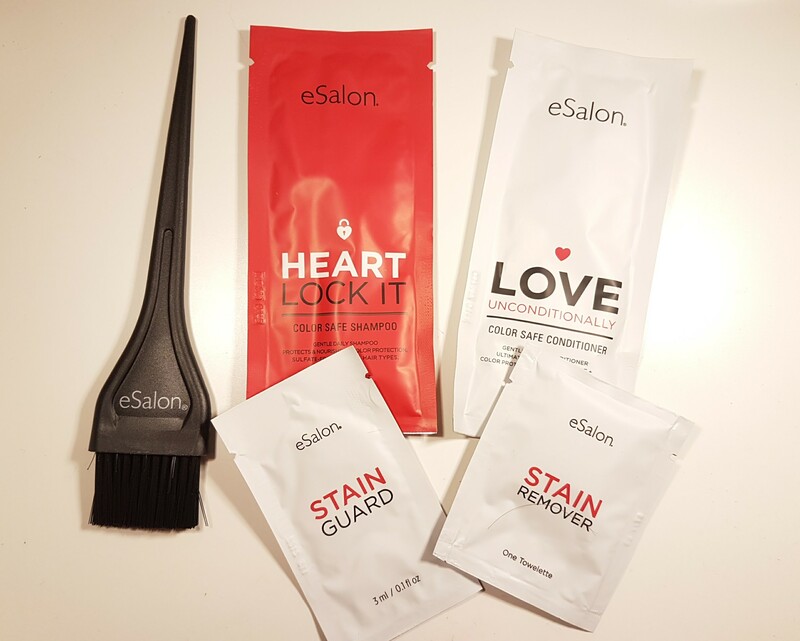 Have you ever tried eSalon? If so, what did you think? 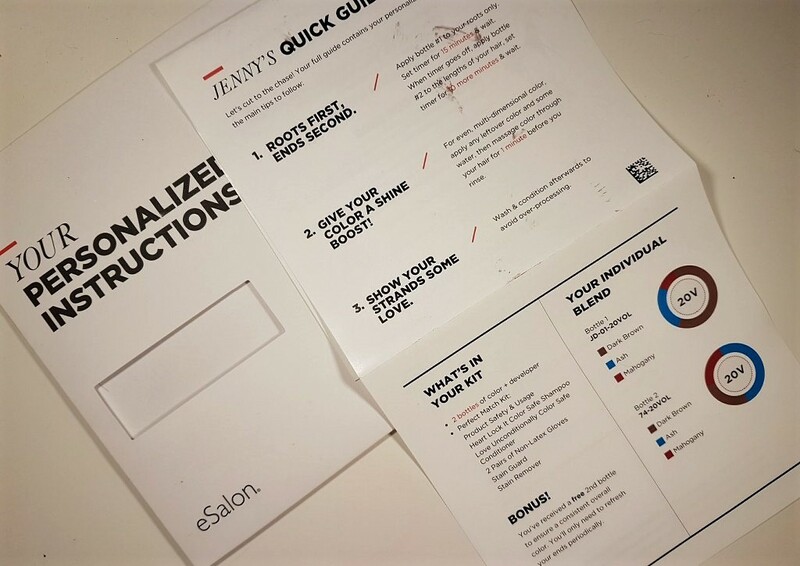 Or would you ever try eSalon? Let me know if you take advantage of the half price kit, I would love to see your results. I love the sound of this! And your hair colour does look fantastic. I’m definitely going to try it out. I’ve never heard of this site before. Thank you! I have been holding off doing my roots because I wanted something different. But now my roots are about 2 inches long… probably time to sort it out. lol. Your colour looks great btw. No problem, I’m glad I could help. It’s such a bargain I couldn’t just keep it to myself . I always leave my hair too long between dying it. I think this will make me be more excited to do it as well, especially as it’s so personalised. Let me know what colour you go for and how it turns out. Such a fabulous price! I’ve never tried putting a colour on my hair! I’m so nervous it will go wrong! The shade is beaut on you! I hope you get the colour you are wanting. Let me know how you get on with it and if you like the colour you receive. I’ve paid for my order with eSalon and nothing has arrived. The website said that the expected delivery date was yesterday but nothing’s turned up and no notification has been sent to say when the package will arrive. Am not happy with their service. I wouldn’t buy from them again. Hi, sorry to hear that. I know it comes from America and I don’t think the delivery date is the date it’s due to arrive, rather the date they post out your order. It should have information on their website about your order. It also states “In Canada, the United Kingdom or the European Union, your delivery may take a full 12 business days from the day of shipment.” I’m sure there is contact information on there as well so they would be able to help you out. Hope that helps.